The final day of group games would see ladder positions finalised and quarter finals take place. Group A saw runaway leaders Ruiz Football Academy top the group while Soccer De Brazil Yellow finished in second place to round out Group A. Group B saw 7 Stars Football top the group with a maximum eighteen points from their games. Adelaide Futsal Club were sat in second place meaning they will face the powerhouse that is Ruiz Football Academy while 7 Stars Football take on Soccer De Brazil Yellow. The Under 10’s Semi Finals were decided with Adelaide Magic to face Soccer De Brazil Gold, Metro Stars will also face Soccer De Brazil Black. 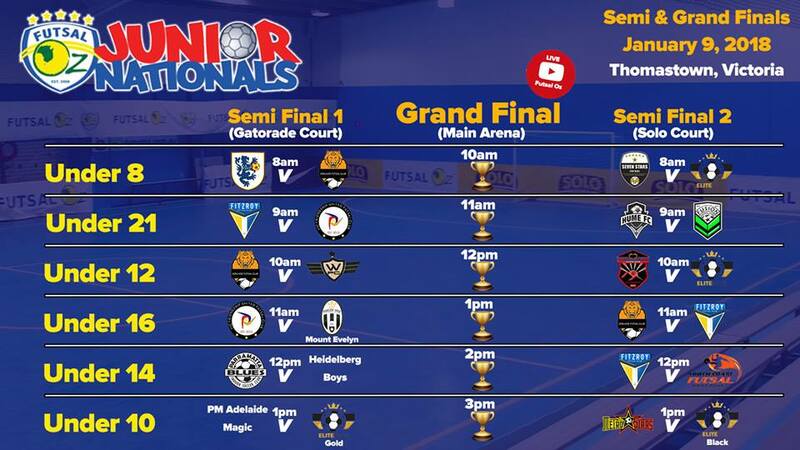 In what is set to be a massive day of action be sure to get down to Futsal Oz Thomastown not to miss a moment. 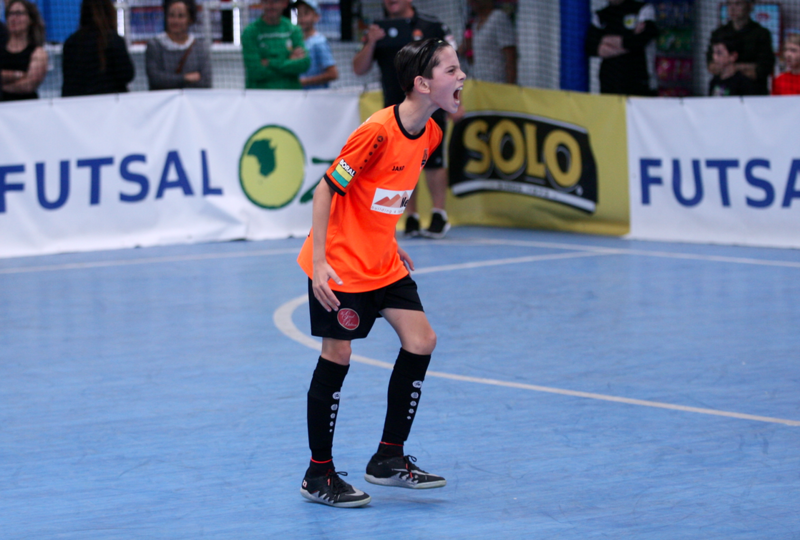 Group A of the under 12’s saw Adelaide Futsal Club win the crucial clash with Thomastown Lions to top the group with the Lions facing third placed Brisbane Elitefoot Futsal in the Quarter Final and going down in a shock result which saw them eliminated from the tournament. Brisbane would go on to face the ever dangerous Claremont Cambio Cumbre in a blockbuster semi final clash. Wonderers would knock out the Green Buffaloes in a tight and tense Quarter Final to set up a clash with Adelaide Futsal Club. Plenty on the line as the under 12’s looks to be the most exciting division. The final round of the under fourteens would prove a carbon copy of the semi finals with the Red Devils conceding in the final seconds of their game against Carlton to see them put out of the tournament with Parramatta Blues topping the Group and set to face off against Heidelberg United who they comfortably trounced in their final group game. Fitzroy FC will go up against North Coast NSW who they overcame in todays clash 4-2 which proves to be a lot closer that semi final one. Group A of the Under 16’s saw Vic Friendship qualify after going through the group stage undefeated to top their group, in some extraordinary circumstances Fitzroy required a victory by four goals or more to gain qualification and an 8-2 win over North Coast Futsal eliminated Pascoe Vale Devils on goal difference the toughest way to go out of a competition. Adelaide Futsal Club topped Group B while Pascoe Vale Mt Evelyn was second best. It sets up Adelaide Futsal Club against Fitzroy Futsal Club while Vic Friendship will face Pascoe Vale Mt Evelyn in what should be some entertaining clashes. The Under 21’s Group A ended with Fitzroy topping the group remaining undefeated throughout the Group stage with Adelaide Fusion close behind in second place. Hume FC would top group B closely followed by arc rivals Vic Friendship which sets up Fitzroy vs Vic Friendship & Hume vs Adelaide Fusion semi finals encounters which proves to be of the highest quality.